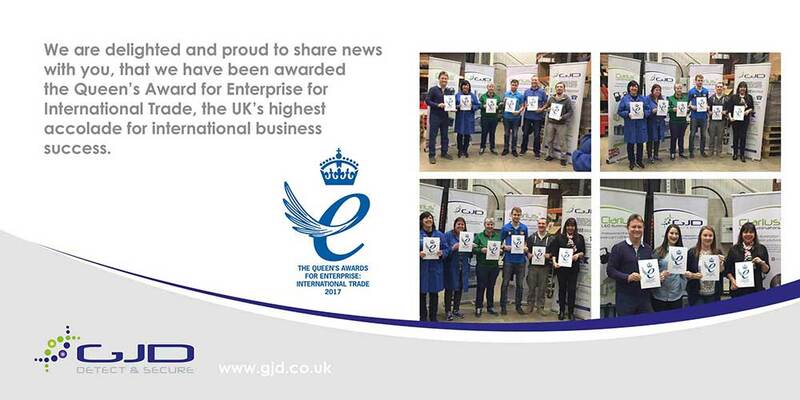 GJD, one of the world’s leading manufacturers and designers of electronic perimeter detection and high performance LED illumination, is delighted and proud to share news with you, that we have been awarded the Queens Award for Enterprise for International Trade, the UK’s highest accolade for international business success. Her Majesty the Queen has approved the Prime Minister’s recommendation for GJD to be honoured with this award owing to the company’s significant growth and success in export trade over the past six years. The Lord-Lieutenant of the County, The Queen’s local representative will visit GJD’s premises in Heywood, Greater Manchester later in the year to present this award. Two representatives from GJD will also attend a reception at the Palace later in the year. Mark continued to say: “This is the most prestigious award that GJD has ever won and it will further ensure our respected position within the security industry both in the UK and worldwide. We thank our loyal distribution network, customers and partners for their ongoing support, without them this would not have been possible”. For 35 years, GJD has been designing and manufacturing innovative security solutions which rapidly identify and validate genuine alerts, identify false alarm signals and optimise the callout of responders, making GJD products a truly valuable asset to both people and properties in all industry sectors across the world. Winning a Queens Award means that GJD can inscribe The Queens Award Emblem on letters, advertising, marketing or packaging for five years.